503 Beacon is located on the south side of Beacon, between Massachusetts Avenue and Charlesgate East, with 501 Beacon to the east and 505 Beacon to the west. 503 Beacon was designed by Harris M. Stephenson, architect, and built in 1888 by David Connery & Co., masons and builders, for Edward Burgess and his wife, Caroline Louisa (Sullivant) Burgess. 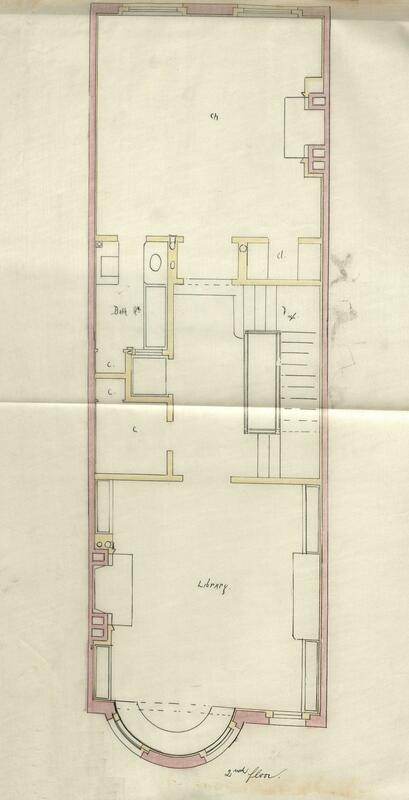 He is shown as the owner on the original building permit application, dated April 23, 1888, and on the final building inspection report, dated November 24, 1888. Edward Burgess purchased the land for 503 Beacon on February 23, 1888, from Nelson S. Bartlett. It was the eastern half of a 40 foot wide lot Nelson Bartlett had acquired on February 16, 1887, from Louis Curtis, part of a 75 foot wide lot Louis Curtis had purchased on November 24, 1885, from Lewis A. Dabney. Lewis Dabney had purchased the lot on October 31, 1885, from Henry M. Whitney. The land was part of a parcel originally purchased from the Boston Water Power Company on June 1, 1880, by a real estate investment trust formed by Francis A. Palfrey, Francis A. Osborn, and Grenville T. W. Braman. 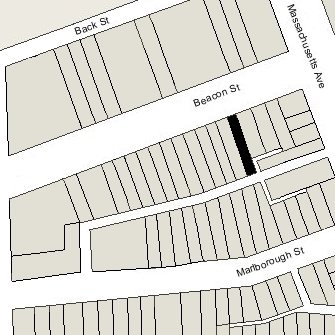 Click here for an index to the deeds for 503 Beacon, and click here for further information on the land west of Massachusetts Avenue between the south side of Beacon and the north side of Commonwealth. By the 1889-1890 winter season, Edward and Caroline (Sullivant) Burgess had made 503 Beacon their home. They previously had lived at 425 Marlborough. Edward Burgess was secretary of the Boston Society of Natural History and an instructor of entomology at Harvard. In the mid-1880s he became a designer of sailing yachts. Among the yachts he designed were the Puritan, which won the America’s Cup in 1885, and the Mayflower, which won the Cup in 1886. Edward Burgess died in July in 1891 and Caroline Burgess moved to an apartment at 409 Marlborough. 503 Beacon was not listed in the 1892 Blue Book. On February 24, 1892, 503 Beacon was purchased from Edward Burgess’s estate by Lyman Blanchard Greenleaf. He married in April of 1892 to Ellen M. Browning and they made 503 Beacon it their home. He previously had lived at 5 Mt. Vernon Place. Lyman Greenleaf was a stockbroker and vice president of the Boston Stock Exchange. On July 18, 1892, he transferred the property into his wife’s name. During the 1897-1898 and 1898-1899 winter seasons, the Greenleafs were living at the Hotel Brunswick (southeast corner of Clarendon and Boylston) and 503 Beacon was the home of Dr. George Holmes Bixby, a physician. He was a widower. His daughter, Mary Alison Bixby, and his sister, Emma Adaline (Bixby) Vermyne, the widow of Dr. John J. B. Vermyne, lived with him. Mrs. Vermyne and Miss Bixby previously had lived at the Hotel Victoria at 273 Dartmouth. Dr. Bixby had lived at 28 Marlborough in 1895 and probably in New Bedford thereafter, where he maintained a medical practice. By the 1899-1900 winter season, they had all moved to 16 Exeter (196 Marlborough). By the 1899-1900 winter season, the Greenleafs were living at 503 Beacon once again. They continued to live there during the 1920-1921 winter season but moved thereafter. 503 Beacon was not listed in the 1922 Blue Book. On March 19, 1921, 503 Beacon was acquired from Ellen Greenleaf by Dr. Thomas Frederick Broderick, Jr. He converted the property into medical offices and what appears to have been three apartments. Dr. Broderick was a physician and orthopedic surgeon, and maintained his offices at 503 Beacon. He and his wife, Ellen G. (Green) Broderick, lived in Brighton. One of the apartments at 503 Beacon became the residence of Miss Margaret C. Keegan, who was Dr. Broderick’s secretary. By the 1922-1923 winter season, another of the apartments was the home of Dr. Martin William Peck and his wife, Wilda Claire (Strong) Peck. He was a physician and also maintained his office at 503 Beacon. He previously had been a medical officer at the Boston Psychopathic Hospital at 74 Fenwood Road in Roxbury, where he and his wife also had lived. Wilda Peck was an assistant instructor at Simmons College. They continued to live at 503 Beacon during the 1923-1924 season, but moved thereafter. By the 1923-1924 winter season, the third apartment at 503 Beacon was the home of Mary (Haley) Moran, the widow of Dr. Martin W. Moran. She previously had lived at 43 West Cedar, and before that had been in Bucharest, Rumania, where she was engaged in war relief and reconstruction work with the Red Cross. Prior to going to Europe in 1918, she had been a lecturer on institutional management at Simmons College. She continued to live at 503 Beacon until about 1925, when she moved to Cleveland. By the 1925-1926 winter season, one of the apartments had become the home of Dr. Henry Alden Shaw. He previously had lived in Newton. A physician, he also maintained his office at 503 Beacon. He had spent much of his career as a surgeon in the US Army, including supervising the general military hospital in Bordeaux during World War I and serving as commissioner of the League of Red Cross Societies in relief work in Poland, Lithuania, and Salonika. He had retired from active service in 1921 and was made a brigadier general in the reserves in 1922. He was a widower. His mother, Eliza Antoinette (Thompson) Shaw, lived with him. They continued to live at 503 Beacon until about 1934, when he moved to New York City; Eliza Shaw probably moved to Rutland, Massachusetts, where she died in 1937. By 1927, one of the apartments had become the home of Alexander Duff, an accountant, and his wife, Margaret (Manning) Duff. They had married in 1926 and 503 Beacon probably was their first home together. They continued to live there until about 1934, when they moved to Wellesley. 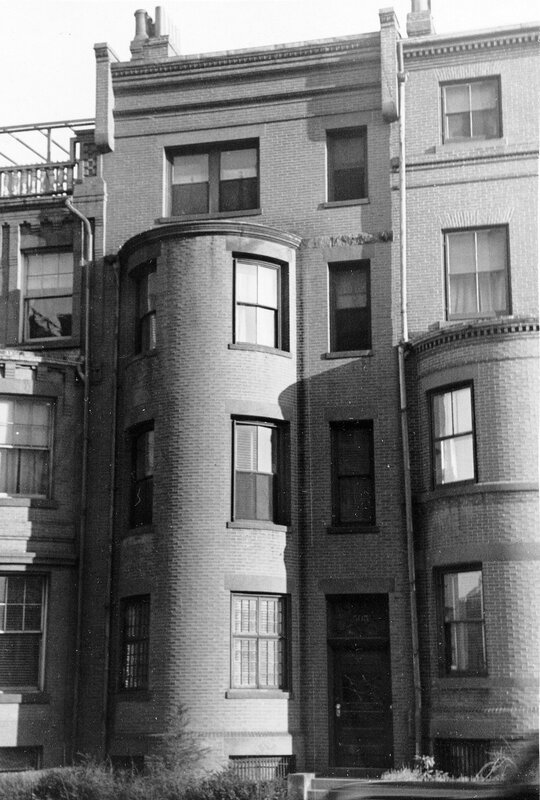 Margaret Keegan continued to live at 503 Beacon until about 1934, when she moved to an apartment at 27½ Massachusetts Avenue. She continued to work as Dr. Broderick’s secretary at 503 Beacon until about 1936. 503 Beacon was not listed in the 1935 Blue Book. By the 1935-1936 winter season, Thomas and Ellen Broderick had moved from Brighton and made 503 Beacon their home, occupying it as a single-family dwelling. Ellen Broderick died in July of 1936 and Thomas Broderick continued to live and maintain his medical office there. He also maintained a home in Framingham, where he owned the Hickory Hill Stock Farm, where he bred horses. On October 6, 1944, he transferred 503 Beacon to Hickory Hill Farms, Inc.
Thomas Broderick married again in 1944 to Mary Osborne. They continued to live at 503 Beacon until about 1955. On February 26, 1957, 503 Beacon was purchased from Hickory Hill Farms by real estate dealer Samuel Wasserman and his wife, Ella Frances (Brennan) Wasserman, and on May 14, 1957, it was purchased from the Wassermans by Joseph Mordini. That same month, Joseph Mordini applied for (and subsequently received) permission to convert the property into ten apartments. On his application, he indicated that the prior use had been as a lodging house. On June 27, 1958, 503 Beacon was acquired from Joseph Mordini by Albert Leo Hollingdale and his wife, Margaret E. (Tabor) Hollingdale. They lived at 82 Bay State Road. They also owned dormitories at 517–519 Beacon, which they operated as Hollingdale Hall, and at 425–427 Marlborough, which they operated as Tabor Hall. On September 1, 1960, 503 Beacon was acquired from the Hollingdales by real estate dealer Hugh Richardson Farrington and his wife, Clara Marcellina (Cormier) Farrington, as trustees of the Hugh J. Trust. They lived in Arlington. On the same day, they also acquired 517-519 Beacon and 425-427 Marlborough from the Hollingdales. On March 1, 1965, 503 Beacon was acquired from the Farringtons by John Warren Carr. On October 18, 1967, he transferred the property to himself, as trustee for his benefit and the benefit of his children, John Jennis Carr and Diane Lisa Carr, and on April 12, 1969, he transferred the property to his mother, Emma Augustus Stevens (Brennan) Carr, the widow of Earl W. Carr. She lived in Hull. She was the sister of Ella Frances (Brennan) Wasserman, the wife of Samuel Wasserman, who had owned 503 Beacon in 1957. On February 18, 1975, the Home Savings Bank foreclosed on the mortgage it held on 503 Beacon and took possession of the property. 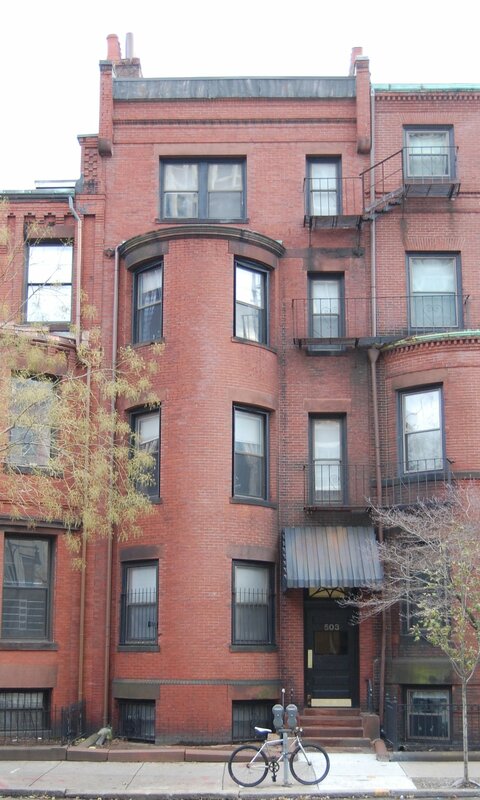 The property changed hands, including going through foreclosure two more times, and on October 31, 1978, was purchased by James H. Mitchell and John D. Mitchell, trustees of the 503 Beacon Street Trust. On March 30, 2001, James Mitchell and John Mitchell transferred the property to the Bobson Robertson Realty LLC, of which they were the managers of record. 503 Beacon remained an apartment building in 2018.